A little bit of sunshine came my way today, and much needed it was! It's always fun times receiving ARCs in the mail, especially when they're from the author...but this one takes the cake! 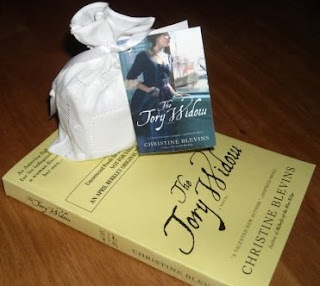 Christine Blevins, author of Midwife of the Blue Ridge, has graced Passages with a review copy of her new novel, The Tory Widow! And much to my surprise there was a little goodies included! Isn't it cute? The front of the tag is a image of the book cover and I've included what was written on the side of the tag that describes what's inside. What a clever idea! Much thanks to Christine! "Pardon, sir, but does that way lead to the river?" She pointed from whence he came. "Aye...ye can cut through t'Cortlandt Street," he said. "They've yet set to a barricade on Cortlandt." An admirable Tonic. Bathe the temples and forehead with this distillate to allay Giddiness of the Brain, and to calm palpitations of a Nervous sort. Useful for keeping, lice, fleas and mosquitos at bay, throw the Water among your clothes, and Grateful they will smell. 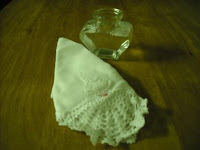 Keep a handkerchief doused with Sweet Lavender water on your person to help mitigate an Unbearable Stink. When I saw this title I thought it was a book review and wondered, "Who would ever read something called that?" As soon as I saw the pictures, I knew exactly what you were talking about. Mine came today, too! I love the bottle and the hankie. I can't wait to dive into that book. that's so much fun! I love getting goodies as a plus- and with a book, well that's just perfect! I am really hoping to read this! How cool!! Looks like a good book, too. I'm so jealous! That's such a cool book package. And loving historical fiction, I'm going to have to get my hands on this one. What a great way to package her ARC! I have Midwife of the Blue Ridge but I haven't read it yet. That's a very cool way to get an ARC! Mine came yesterday as well, although it came to my office so I just got it today. I'm excited to get it home and open the lavender water. She's so creative! Very nice, Miss Thing!! Enjoy it!